A peculiar gene. There is one gene in the small world of epilepsy genetics that has always troubled me. A gene that has an unknown function and is not expressed in the postnatal brain, but is well established as one of the few genes for autosomal dominant Juvenile Myoclonic Epilepsy (JME). This gene is EFHC1. Now, a recent paper in Epilepsia reports EFHC1 as a possible candidate gene in autosomal recessive epileptic encephalopathy with neonatal onset. The mystery surrounding this gene continues. The EFHC1 story. The EF-hand domain containing 1 gene entered the stage in 2004 for the first time when Suzuki and collaborators identified the causative gene for JME in several families from the Americas. 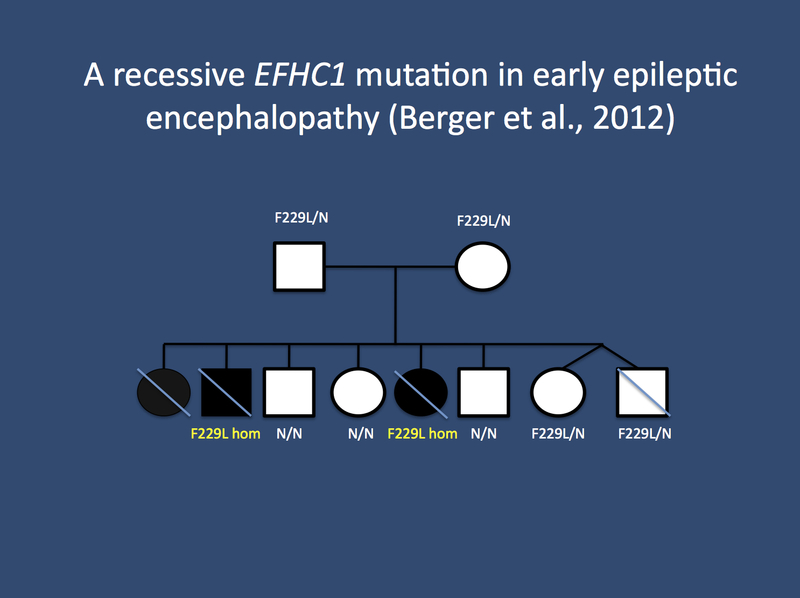 In subsequent publications, further variants in EFHC1 were found in JME, but also in other epilepsy subtypes. The frequency of EFHC1 variants appears to be particularly high in patients from Mexico, Honduras and Japan as suggested by Medina and collaborators. However, EFHC1 variants in sporadic cases need to be regarded with caution. The frequency of these variants in the general population is often unknown and it is not clear whether these rare variants are benign rare variants, risk factors or even causative, monogenic variants. The function of EFHC1 is largely unknown and this gene only appears to be expressed in the embryonic choroid plexus, the structure within the ventricles that produces the cerebrospinal fluid (CSF). In terms of possible mechanisms for epilepsy, the choroid plexus is miles away from neuronal tissue. A recent study by de Nijs and collaborators suggests that EFHC1 is important for the migration of neurons and that EFHC1 mutations impair mitotic spindle organisation. Recessive EFHC1 mutations. In their paper in Epilepsia, Berger and colleagues aim to find the causative gene in a family with three affected children. All three children had a neonatal-onset epileptic encephalopathy with suppression-burst on EEG, one of the most severe signs for cerebral dysfunction, and various, intractable seizure types. The epilepsy syndrome resembles Othahara Syndrome. A thorough metabolic work-up did not identify an underlying neurometabolic disorder, and imaging showed non-specific atrophy and hypomyelinisation. All affected individuals died in early childhood. The authors performed genetic analysis using SNP arrays to identify a region of homozygosity, which segregates with disease. Assuming recessive inheritance, finding such a homozygous region might point towards a candidate gene. The authors went on to identify a ~11Mb region with 110 genes. Using exome sequencing, they identified a variant in EFHC1 as the only possible candidate variant in this region. This F229L variant (exchange from phenylalanine to leucine at position 229) has previously been reported as a candidate variant for JME in the reports mentioned above. The family investigated by Berger et al. The family is of Morrocan-Jewish descent. Both parents and some unaffected sibs were heterozygous for the F229L mutation, both affected individuals were homozygous for this variant. Causative or not? In a previous post, we have talked about the exome fallacy. Exomes are notoriously porous and hardly cover all exons with in a larger target region completely. It can be estimated that ~20% of exonic sequence in the 6p region might have gone undetected in the study by Berger and colleagues. This means that probably 10-15 missense variants might have been missed given the ~40 missense variants they identified. Therefore, the case for EFHC1 cannot be made through the fact that other variants have been excluded. So what evidence is there for a pathogenic role of F229L? Dissecting a variant. The authors refer to earlier papers suggesting F229L as a candidate gene for JME. However, already the report by Stogmann and collaborators indicated that this variant is also present in the general population. The 1000 Genomes Project now allows us to estimate the population frequency. The genetic variant c.685T>C, also known as SNP rs137852776 is present in 0.7% of all individuals. Accordingly, demonstrating a sufficiently robust association with JME would require a large cohort of 1000-2000 patients. Therefore, this variant is a suggestive candidate gene, but not an established risk factor. Also, functional prediction programs suggest that the effect of this mutation is benign. The authors point out that no homozygous F229L variant has been observed yet. However, given the low frequency of this variant, this is not surprising and not a deviation from the Hardy-Weinberg-Equilibrium using the current 1000 Genomes data. What it takes to claim causality in recessive disorders. Don’t get me wrong, I think EFHC1 is a good candidate gene for this syndrome. However, I am not sure whether the evidence from the JME studies is sufficiently strong to claim causality. Therefore, this paper raises an important question that also puzzles us currently with our EuroEPINOMICS trio data: when is a homozygous variant convincing enough to be called disease-causing? This question is relevant since every individual carries between 3 and 5 genes affected by homozygous variants, which are likely to alter the function of the resulting protein. The answer to this question is replication or functional data. Replication may occur by finding another patient with a similar phenotype caused by a mutation in the same gene. Functional data would imply demonstrating an effect in animal models or in vitro suggestive of a disease-causing role of this gene. If neither replication nor functional data is present, the interpretation is difficult. And this is a difficulty that we will be facing more and more often when analysing trio exome data. Not even known disease genes are immune. It is relatively easy to infer causality of an identified mutation if this variant has been described before as disease-causing. This is the case with many founder mutations in recessive disorders, as in the case of Lafora disease in the Arab population. However, things become more difficult if novel variants in known disease genes are identified as the population variation of these genes is not yet known. This is the case for SMPD1 (Niemann-Pick-Disease Type A) and SETBP1 (Schinzel-Giedion-Syndrome), two genes for monogenic disorders, which also have rare insertion/deletion variants that appear disruptive at first glance, but turn out to be functionally neutral population variants. I am mentioning this as we fell for both genes in the past, thinking that they may be causative in some of our EuroEPINOMICS trios. A novel definition of recessive. In the age of high-throughput genomics, a new framework for interpreting recessive mutations is necessary, in parallel to the emerging stringency for interpreting de novo mutations. With large-scale trio exome data in several neurodevelopmental disorders, the next few years will show whether looking for novel recessive mutations is a useful paradigm to robustly identify novel candidate genes. This entry was posted in 2012, Brain malformations, Epileptic encephalopathy, EuroEPINOMICS, Familial epilepsies, Papers and tagged autosomal recessive disorders, EFHC1, epileptic en, homozygosity mapping, juvenile myoclonic epilepsy, neonatal onset, Othahara Syndrome, whole exome sequencing. Bookmark the permalink.